Last Tuesday, October 16th, members of Hacienda CDC’s resident-led bike committee, Andando en Bicicletas en Cully (ABC), New Columbia’s We All Can Ride, and staff from Verde and the Community Cycling Center, met to share stories and best practices with regards to bike advocacy in their communities. 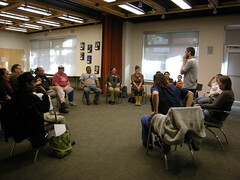 Even though there could have been a challenge with communication between groups who speak different languages, the participants connected through their shared excitement and passion to make access to bicycling a priority in their communities. Once the participants established eye contact, there was an amazing feeling of recognition that there are other groups in our city who are committed to improving access to bicycling and both committees took great comfort in knowing that they were not alone. The meeting included dinner, a tour of the New Columbia Bike Repair Hub, and presentations about each committee’s experiences. Lourdes, a member of ABC, shared the group’s work conducting a bike survey and compiling data as part of the bike storage project. The committee members went door to door to capture information on bike storage and bike theft. 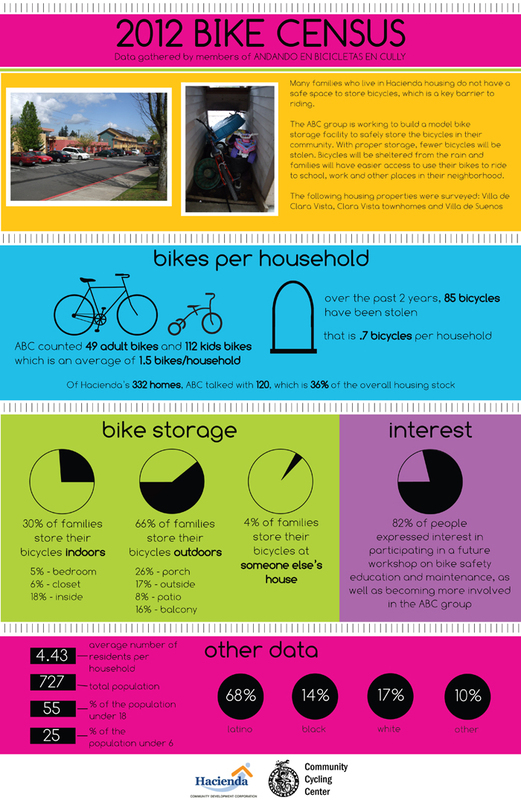 Lourdes shared their bike cesus infographic illustrating some of the group’s findings. This sparked an interesting discussion on bike theft in their community. Rafael, who is usually very quiet, picked up on the group’s excitement and was quite adamant that the bicycle is a “green” amenity and when builders think about building new homes and apartments, it should be a policy that they think about bike storage the same way they think about storage for cars. We All Can Ride shared stories on leading rides and the importance of teaching safe riding behavior. Linda mentioned an experience she had with leading a group of kids on a ride. When they stopped at a yield sign, the kids asked why she did that. Her story highlighted the need for rules of the road and safety education. While listening to Hacienda’s stories, Michelle from New Columbia was very energized to visit Hacienda to see what members of ABC were doing and how they ran their workshops. 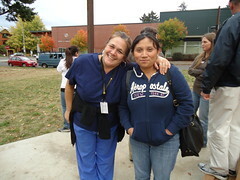 This was a group of people doing exactly what she wants to do at New Columbia, and she was excited to learn from them. Building momentum in each community takes time, and can often be challenging. 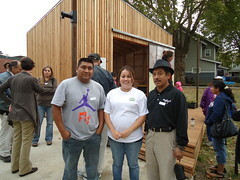 We are excited to be involved in both efforts, and to be able to introduce the groups to one another. We look forward to future partnerships and collaborative storytelling.